AND THE WINNER IS… Ernie Lai who will receive a copy of the SdJ-nominated Strasbourg. Congratulations, Ernie. My thanks to Pegasus Spiele for providing the prize for this competition and to everyone who entered by all the various means. To celebrate reaching 500 Twitter followers, Metagames is giving away a copy of Pegasus Spiele’s SdJ-nominated Strasbourg this week. I reviewed the game a few week ago and really enjoyed it. You can read the Strasbourg rules here. Anyone who is following @Metagames twitter account and has re-tweeted the competition phrase that I tweeted (which says I would like to win a copy of Pegasus Spiele’s SdJ-nominated Strasbourg). – It’s important you re-tweet the @Metagames tweet so that I can see your entry. 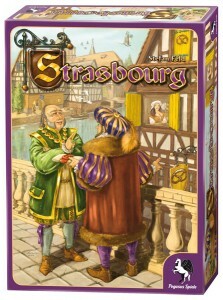 Anyone who posts a comment on the Metagames review of Strasbourg saying, “I want to win a copy of Stefan Feld’s Strasbourg”. To maximise your chances of winning, you can enter using all 4 methods described above. The finalists will be announced on Monday 27th June and the winner selected at random on the same day. Note that multiple entries using the same method (i.e. re-tweeting multiple times, adding multiple comments) will not count. My thanks to Pegasus Spiele for providing the prize for this competition. The Spiel des Jahres nominees were revealed last week. Below is a list of the nominees with easy links to reviews of most of them. Luna was also on the list of recommended titles. 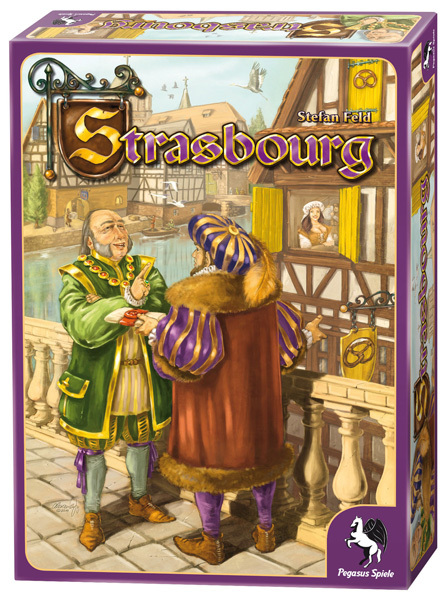 The rules of Strasbourg immediately caught my attention as the game has an unusual but simple bidding mechanic as well as some placement too. During the game, players use their influence to affect the guilds and score victory points (VPs). At the start of the game, each player can keep 1 to 5 secret objective cards which earn VPs at the end (or -3 VPs if not fulfilled). Each player starts with a deck of 24 influence cards (4 x values 1-6) which they will use over the game’s 5 rounds. Each round, players draw as many cards as they like (one at at a time) from their deck into their hand. Then, each player arranges their cards into any number of face-down stacks of their choosing.